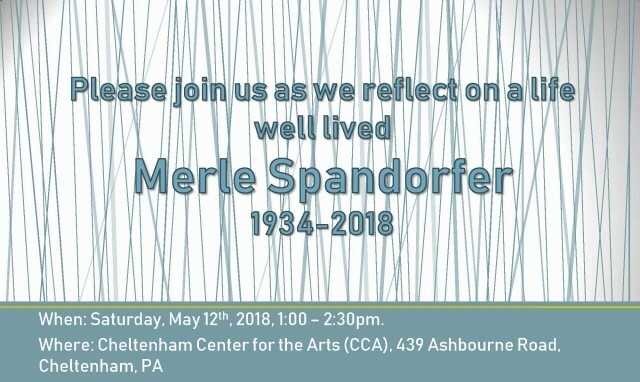 The Cheltenham Center for the Arts is saddened to announce that our beloved teacher, printmaker and friend, Merle Spandorfer, passed away on Thursday, April 5th, 2018. Thank you to all who attended and joined us in celebrating a life well lived. At Merle's and her family's request a selection of her work is available for purchase, with proceeds to benefit CCA. All works are available at the Center and are available for viewing. Call 215-379-4660 or email info@cheltenhamarts.org to set an appointment. We are honored to present these works and grateful for the generous support of Merle's family.